This past weekend, I went up to the Stony Point Center in Rockland County, NY, to serve as private chef for a weekend retreat my mom was hosting for her Christian women's ministry group. There were 11 of us staying in a lovely 19th century house located just a couple blocks off the main campus property. Outfitted with antique furniture and rugs, it was a cozy place to spend a few days working. While the women sat through their workshops and group sessions, I busied myself in the kitchen preparing three meals a day (and snacks!) for the ladies to enjoy. I love cooking for retreat groups because it gives me the chance to experiment with recipes that I wouldn't typically make at home since there aren't enough people here to eat it all. I also love the challenge of getting creative, using up ingredients and repurposing leftovers so that there is very little waste. I made a few dishes that I'll be sharing here, the first being these Crispy Roasted Lemon Chicken Thighs that I served for lunch the final day of the retreat. This is one of those dishes that is beautiful and impressive once served, but incredibly low-fuss to prepare. I served it with rosemary & garlic-scented potatoes au gratin, couscous, and a big arugula salad. Pat chicken thighs very dry, then place in bowl. In a separate bowl, whisk together oil, lemon juice and zest, minced garlic, and mustard. Pour over chicken and season generously with kosher salt, black pepper, and crushed red pepper (if using). Cover and marinate in fridge at least one hour. Preheat oven to 400 degrees. Arrange chicken, skin side up in a roasting pan. 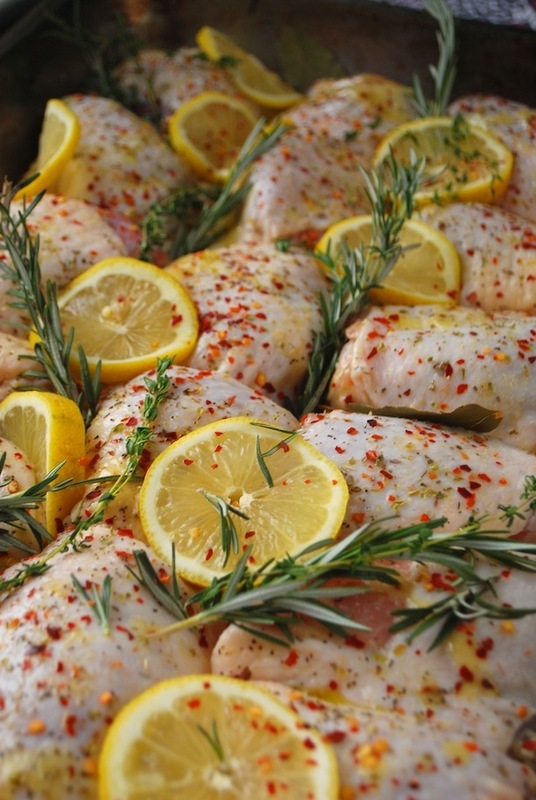 Tuck in slices of lemon and rosemary sprigs (if using). Roast uncovered 40 minutes, or until skin is golden and crispy and chicken is cooked through.